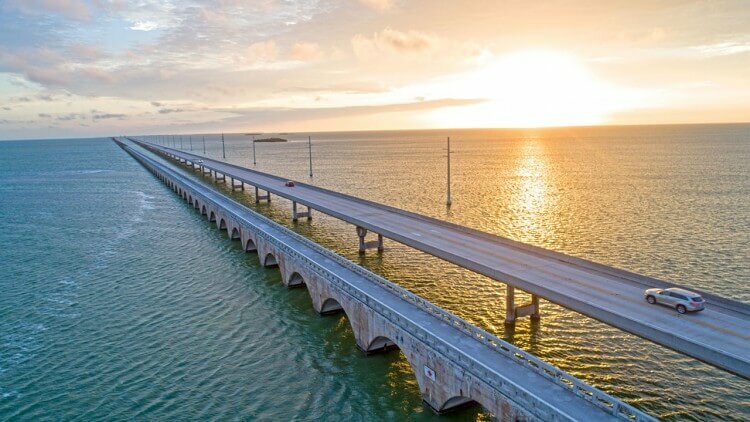 The Florida Keys Scenic Highway is the stretch of US 1 that travels through some of the nation’s most spectacular tropical scenery from Mile Marker 110, north of Key Largo, to Mile Marker 0 in Key West, the southernmost point in the continental United States. Driving down the highway where the Atlantic Ocean and Gulf of Mexico meet is an unparalleled experience, with the shallow sandy shelf of clear water reflecting bright turquoise, emerald, and aquamarine waters stretching out as far as the eye can see. The reef keeps the near-shore waters calm, and relaxation sinks in as you find beaches and palm trees swaying in the tropical breeze. And the bridge crossings bring you the sense of being out on the island chain in a way that only driving through the Keys can. Travelers will see and experience outstanding natural beauty, world-class fishing and diving, festivals, beaches, sunset celebrations, state and national parks, water sports, historic sites, museums, island cuisine, sunshine, tropical atmosphere, and friendly people that enjoy the laid back lifestyle that is the Florida Keys. The Keys also have a wonderful blend of dozens of unique cultures. Historically, Bahamian and Cuban influences have been dominant since people from these nearby islands (Cuba lies 90 miles off the coast) have been traveling to the Keys for hundreds of years. Culture, music, art, architecture and cuisine of the Keys are steeped in these island traditions. Experience for yourself Cuban, Bahamian and Caribbean food, dance to Salsa music, listen to the relaxing rhythms of an island steel drum band and visit the many museums and galleries full of art influenced by these cultures. All this and so much more is available on the Florida Keys Scenic Highway, the “Main Street” for all that is the Florida Keys. Here’s a state park with a twist: Most of it is underwater. It starts a foot off shore, flows outward 3 miles into the Florida Straits, and encompasses the only living coral barrier reef in the continental United States and roughly 200 islands and islets. Nearby dive shops can get you ready to discover this underwater world. It’s said there are 55 varieties of coral and 500 species of fish, ranging from blue-striped grunts to green moray eels. Shipwrecks here date from as far back as the 1600s. Non-divers will also find plenty to do. There’s a 30,000-gallon aquarium to explore and four types of boat tours, including one aboard glass-bottom vessels that let you stay high and dry while viewing the reefs. You can also rent a canoe or kayak or simply park yourself by the lagoon and enjoy the calm waters and sunshine. Campsites are available, and RVs are welcome. Nearly 50 sites have full hookups; each site has a picnic table and grill. If you stay here (or anywhere in the Keys), bring a telescope or binoculars to watch the night sky. It’s clearer here than nearly anywhere else in Florida. On Lower Matecumbe Key, you can stretch out on the sand and slip your toes into turquoise water. Enjoy a swim in the calm, clear Atlantic Ocean while kiteboarders take advantage of tropical sea breezes. See fishermen, stone crabbers, and lobster divers capture their bounties. Linger along a secluded boardwalk, walk your dog, and picnic at shaded tables among the native mangroves. Park in either of two small lots ¼ mi. apart. The best news? It’s all free. This marine research and educational facility also helps the area’s injured marine animals and is the only federally licensed facility in Florida that’s allowed to help injured manatees. Atlantic bottlenose dolphins and California sea lions are the center’s main residents; learn about their personalities and behaviors. In addition to educational tours and shows, for an extra fee you can enter the water and interact with the dolphins (reservations are required). The Seven Mile Bridge, MM 47, linking the Middle and Lower Keys by crossing a channel between the Atlantic Ocean and Gulf of Mexico, was the longest segmental bridge in the world when built in 1982. It rises 65 feet for boat clearance, the highest point in the Florida Keys, with breathtaking views. And it runs parallel to Flagler’s 1912 railroad bridge which has arches reminiscent of a Roman aqueduct and portions that are still accessible to pedestrians and bicyclers. It was just another island until Henry Flagler’s railroad connected the mainland to Key West. Even though the railroad is gone, Bahia Honda became one of the southernmost state parks in America. If you stop before reaching Key West—a little more than a half hour away—you’ll find camping (full-facility campsites and vacation cabins), fishing, diving, snorkeling, hiking, kayaking, and one of the country’s top beaches. Snap photos of Flagler’s historic railroad trestle, and enjoy the Atlantic and Gulf of Mexico views. Relax on the beach; take a swim in the calm, clear water; explore the nature trail; or picnic in one of the pavilions. For a few hours or a few days, the park has year-round appeal. Standing just about 2 feet high, key deer are miniature versions of their much larger cousins, the white-tailed deer. When their numbers were rapidly dwindling in the 1950s, they were given the protection of this 9,200-acre refuge comprised of pine rockland forests, freshwater wetlands, saltmarsh wetlands, and mangrove forests. Within its boundaries, deer numbers have increased to nearly a thousand, an indication that they, like other refuge wildlife, are thriving. There are walking trails, wildlife viewing areas, and a visitors center less than a mile from the intersection of U.S. 1 and CR 940. In the 1930s, Ernest Hemingway made Key West his home. Some say it was the idyllic setting of Key West that inspired him to write classics like For Whom the Bell Tolls, To Have and Have Not, and A Farewell to Arms from the privacy of his second-story writing room. Others say it was sheer coincidence. Regardless, the works earned him the 1954 Nobel Prize for Literature. There are only 14 lighthouses in America older than this one, which was activated in 1848, and, uniquely, with a woman as keeper. Climb the 88 steps to the top, where you can take in a wonderful view of the island; it’s a perfect vantage point for photographs. Afterward, tour the Keepers’ Quarters filled with historic instruments, maps, and photos that depict a rich maritime history. In the 1960s, a few friends began to gather on the wooden docks of the old salvage warehouse district at the west end of Duval Street to watch Key West's spectacular sunset each evening. By the '70s, the sunset watchers' ranks had swelled a bit, with a few free spirits strumming guitars, and craftspeople selling their wares. Today, Mallory Square, a souvenir shopper's mecca by day, transforms itself into a rollicking circus each afternoon, with hundreds of people showing up for the Sunset Celebration. Arrive an hour before sundown to see an assortment of entertainers—tightrope walkers, jugglers of torches or chainsaws, musicians, strongmen, and trained acrobatic cats. As a result, this sunset celebration one of the most popular shows in Florida. The festivities continue for about an hour after the sunset. One of the country’s most photographed landmarks, the giant yellow, red, and black buoy-shaped monument marks the Southernmost Point in the continental United States, and notes that Cuba is only 90 miles away (if you’re up for a swim). It can get very crowded during the day so arrive early and catch a sunrise photo. 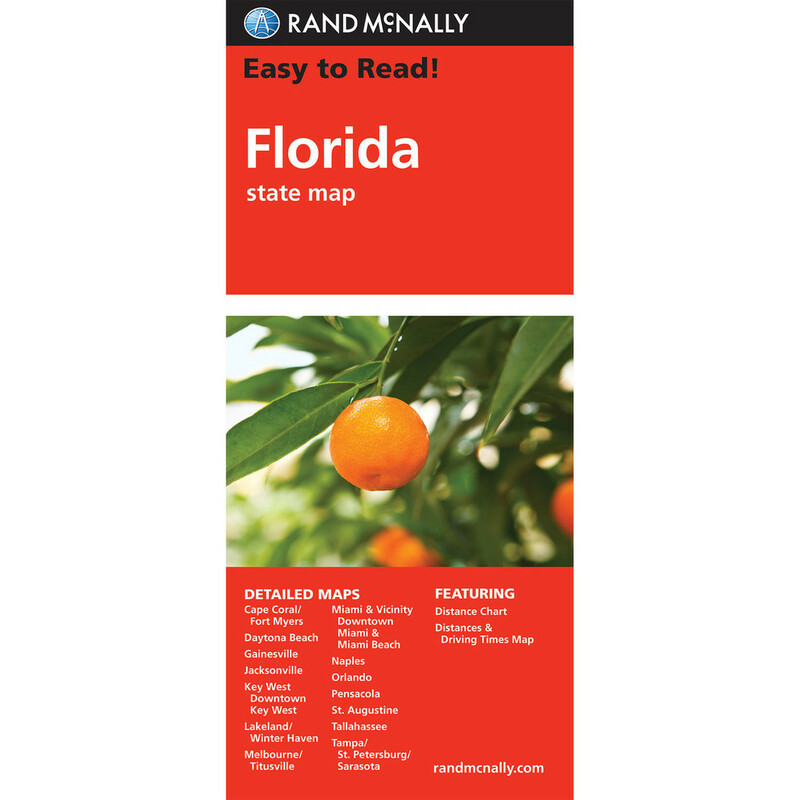 Easy to Read: Florida State Map"